In 2013, the world community of scholars celebrated a millennium after the death in 1013 of the renowned Andalusian physician- surgeon Abu al-Qasim al-Zahrawi (Abulcasis). Abu al-Qasim al-Zahrawi is considered one of the Muslim World’s greatest doctors who excelled in various fields of medicine, such as surgery, pharmacology, anatomy, and pediatrics. He had summed up his medical experience in his huge thirty chapters book Al-Tasrif Li-man ‘Ajaza ‘An al-Ta’alif (The disposal of medical knowledge to he who is not able to get it by himself). To celebrate his work, we compile and republish in this folder articles originally published in www.rabieabdelhalim.com. The year 2013 was the millennium anniversary of the death of the distinguished surgeon Abul-Qasim Khalaf Ibn Abbas Al-Zahrawi, who lived in the period from 930-1013. However, still little is known about his pivotal role, like other medieval Islamic scholars, not only in preserving and critically evaluating the surgical and medical heritage of the ancient and Greco-Roman civilizations, but also in having integrated surgery into scientific medicine through his careful observations, vast personal experience and documented original contributions. Al-Zahrawi was born and raised in Al-Zahra’, a suburb of the town of Qurttoba (Cordova) in Andalucia (now in Spain). It is narrated that his family tree was originally from Al-Ansar of Al-Madina Al-Monawara (now in Kingdom of Saudi Arabia). He is known in the Western literature as Albucasis, Abulcasis, Bucasis (Latinized forms of his Arabic nickname Abu al-Qasim). He was an innovative surgeon who added many original contributions to surgery and medicine. During his lifetime, doctors used to travel from faraway places in order to learn from him. During the Middle Ages and Renaissance in Europe, he remained a renowned teacher of surgery through his well-known single, practical and encyclopaedic work Al-Tasrif Li-man ‘Ajaza ‘An al-Ta’alif (The disposal of medical knowledge to he who is not able to get it by himself from the other compilations), particularly its 30thvolume (treatise or maqala) devoted to surgery and operative intervention. That volume is a landmark in the history of surgery. It is the first rational and complete illustrated treatment of its subject, and the many surgical procedures and instruments described and illustrated in it do not appear in any other work at or prior to his time. It was translated to Latin in 1150 CE by Gerard of Cremona, thus helping its spread to all of Europe, where it remained, through several famous printings, the most important reference book on surgery until the end of the 18th century. Its first translation to a modern European language was by Lucien Leclerc French version published in Paris in 1861 as La Chirugie d’ Albucasiswith an introduction that, interestingly enough, ended with the closing remark ‘el hamdu Lillah’! The original Arabic text of the 30th volume of Al-Tasrif was made available with an English translation and a commentary in 1973 through the classic work of Lewis and Spink Albucassis on Surgery and Instruments, published by Wellcome Institute of the History of Medicine (London, UK). Another printing of the Arabic text of volume 30 of Al-Tasrif was published in Riyadh in 1993 as Al-Jiraha: Al-Maqala Al-Thalathun, Al-Tasrif Li-man ‘Ajaza ‘An Al-Ta’lif edited by A. al-Naser and A. al-Twaijri, and published by Al-Farazdaq Press, and sixteen years later in Damascus as Kitab Al-Zahrawi fi al-Tibb Li-‘Amal al-Jarrahin, edited by M. Y. Zakoor and published by the Syrian Ministry of Culture. Furthermore, the operative technique of Al-Zahrawi as documented in the 30th volume of his Al-Tasriftogether with his contributions to the progress of general surgery and its various branches were critically evaluated in several studies performed and published by surgeons interested in the history of medicine during the second half of the last century. A good example of those studies is the work done by Prof. Rabie E. Abdel-Halim at the urology departments of King Abdel-Aziz and King Saud Universities, with results published in the years 1985-2003. In a modest effort to commemorate the millennium anniversary of the death of Al-Zahrawi, it is a great pleasure for the editorial board of the MuslmHeritage.com to republish, in a special memorial page, some of those above-mentioned studies with due acknowledgment to the original publishers and authors. This Millennium Memorial page also includes links to other articles as well as a selected bibliographic list about Al-Zahrawi’s massive contributions to the progress of surgery and other medical sciences. It is also to be noted that in the published editions of the 30th volume of Al-Tasrif (the operative surgery section of the book), there are still many general and special surgical topics not yet subjected to contemporary evaluation. The volume contains the operative parts of general surgery, pediatric surgery, gynecology and obstetrics as well as orthopedics including, in each entry, the indications, the operative procedures in details, the possible complications and recommended management, in addition to the rest of post-operative care in a style not much different from any current operative surgery manual. Similarly, although 1000 years had passed since the death of Al-Zahrawi, it was only the 30th volume (maqala) of his book al-Tasrif that became edited and, thus, made available for researchers and academicians. Other than Maqala no. 28 on the preparation of different types of simple drugs, which was the subject of a Latin translation towards the end of the 13th century (the famous pharmaco-chemical Liber Servitoris) followed, like the Latinized 30th maqala, by several printings in various parts of medieval Europe, the other 28 maqalas remained totally inaccessible being in the form of unedited manuscripts dispersed all over the world. However in 1963, Sami Khalaf Hamarneh and Glen Sannedecker, in their classic work A Pharmaceutical View of Abulcasis Al-Zahrawi in Moorish Spain, translated and commented on excerpts of the 25th maqala of Al-Tasrif dealing with the ingredients and manufacturing of ointments (adhan) and its uses in medical treatment, thus raising fresh interest in the medical therapy, material medica and pharmacy aspects of Al-Tasrif, almost overlooked by the widespread fame of the surgical aspects of its 30th maqala. Still, until now, there are 25 more pharmaceutical maqalas in the Al-Tasrif encyclopedia of Al-Zahrawi not yet fully edited or studied. It is welcomed news, hence, that in 2004 the Kuwait Foundation for the Advancement of Sciences published the first and second maqalas of Al-Zahrawi’s Al-Tasrif as edited by Dr Sobhi Mahmoud Hamami. This is a remarkable step forwards in the study of the anatomical and pathophysiological basis of Al-Zahrawi’s surgical and medical practice as well as the clinical methods he used. Furthermore, the study of those two maqalas will help in identifying the scientific method used by Al-Zahrawi and discovering the reasons behind his ingenuity and originality. All this will open up a multitude of research opportunities that will help to restore continuity to the progress of medicine, surgery and pharmacy as a joint global contribution of the whole world. Phase after phase, the progress circles of medical theory and practice continued to expand. Indeed, as Durant put it,“civilizations are units in a larger whole, whose name is ‘history’; they do not disappear. The past always rolls into the present”. In the first book (Bab) I spoke of all diseases for which cauterisation is of value, either the actual cautery or that done with caustic medicines; and of their reasons and causes; also the instruments and the shapes of the cauteries. This I set out in chapters from head to heel. Quotation from the Second Bab of the 30th Maqala of Kitab Al-Tasrif Li-man ‘Ajaza ‘An Al –Ta’alif by Al-Zahrawi. Translated from the original Arabic by M. S. Lewis and I. L. Spink, Albucasis on Surgery and Instruments, London, 1973). The bolding is by Rabie E. Abdel-Halim. Two photos for the front and back of an interesting Al-Zahrawi bronze medal recently acquired from e-Bay yet with no available information on its date or occasion of issuing, neither from the vendor nor from the internet. The front engraving shows Al-Zahrawi holding an instrument in his right hand, perhaps his invented straight catheter. He is surrounded by a group of six persons seated at a slightly lower lever, most probably being his students. In front of one of them is a pot on a stand. It is not clear what the contents are and hence the purpose of the pot cannot be reasonably guessed. The Tenth Mosul Medical Conference held in Mosul 1-3 October 2013 allocated a separate session of its program to commemorate the millennium anniversary of the death of Al-Zahrawi . A list of papers presented in that session can be seen on page 12 of the program pdf file on this link: http://www.nineveh-health.gov.iq/final12e.pdf. 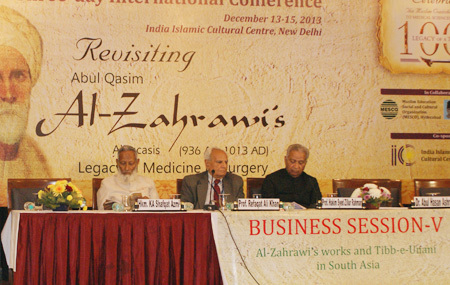 Three-day International Conference on Revisiting Abul Qasim Al-Zahrawi’s Legacy in Medicine and Surgery, December 13-15, 2013 at New Delhi, India. The Institute of Objective Studies (IOS) in association with the Hyderabad-based Muslim Educational Social and Cultural Organisation (MESCO), Maulana Azad Education Foundation, Ministry of Minority Affairs, Govt. 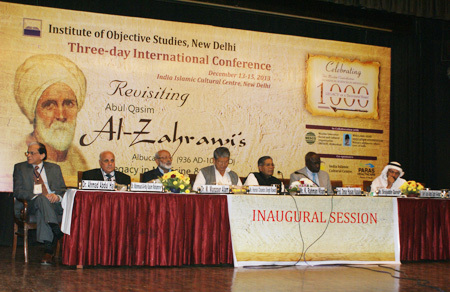 of India and the India Islamic Cultural Centre organised a three-day international conference to mark the 1000th year of the death of Abu-al-Qasim al-Zahrawi, an all-time great physician and surgeon from Andalusia (Arab Spain) from December 13 to December 15 at India Islamic Culture Centre here. Fiogure 1 and 2 show pictures taken during the conference’s sessionsand a full report is available at: http://www.iosworld.org/al-zahrawi_report.php. Islam Forgotten Contributions to the Progress of Medical Science: By Ingred Hehmeyer and Aliya Khan (2009). Abu Al-Qasim Al-Zahrawi the Great Surgeon. By Dr Ibrahim Shaikh (2010). One Thousand Years of Missing History. By Salim Al-Hassani (2010).